Not to be confused with Special 3. 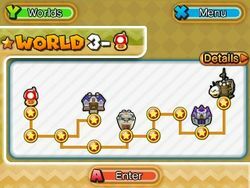 Special World 3, known as ★World 3 in-game, is the third Special World in Puzzle & Dragons: Super Mario Bros. Edition, and is a more difficult version of World 3, with a pink tint in the background. This world consists of ten levels and a Toad House. Morton Koopa Jr. is the boss of this Special World and is fought in his castle and airship. 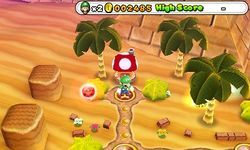 Clearing ★World 3- unlocks Green Winged Yoshi as a Helper; ★World 3- unlocks Morton Koopa Jr. as an ally and Cat Mario as a Leader, and updates the Lucky ? Blocks spot at Toad Houses for the player to have a better chance at winning rare Skill Items. For a listing of course maps in ★World 3, see here. To reach the secret exit in this stage, the player needs to enter the green Warp Pipe at the split path, which can be found after the second set of enemies in the stage. In order to enter the pipe, the player needs to clear more Wood Orbs than Water Orbs. However, since the course does not have Wood Orbs in it, the player must bring an ally that can create them. Upon entering the pipe and defeating the boss at the end, the player unlocks ★World 3- . This page was last edited on April 8, 2019, at 01:12.